Presenting for Geeks is a workshop that I designed to help my fellow geeks improve their presentation skills. The workshop is targeted at a technical audience, such as (but not limited to) software developers, who have to give presentations for one reason or another. It advocates a more visual and engaging presentation style (fewer bullet points!) and was inspired by Garr Reynolds and his Presentation Zen approach. Contrary to what people often think, this presentation style does not only work for keynotes but is also applicable to technical presentations. Here's the offer: I will give this workshop for free at your conference or user group meet-up. I only ask that you cover my travel expenses and accommodation. So you're a geek and you're going to do a presentation about a topic that's close to your heart. You're very enthusiastic about it. You want to tell your audience everything about it. But somehow, even though your presentation covers every detail, it fails to evoke the same sort of enthusiasm in your audience. Why is that? In this workshop, we're going to discuss some of the basic mistakes that geeks tend to make when preparing a presentation and why it causes a disconnect with your audience. You are going to learn about a few simple methods and rules that will help you better adapt your presentation for your audience and help them remember your core points. You are also going to see how and why these techniques work. Topics discussed include the preparation (focus on your audience's needs and expectations), some brief tips on slide design (avoiding bullet point overload), and general tips on the act of presenting (connecting and interacting with your audience). Format: Lecture with exercises (group and single) interspersed. Please note that this does not include any actual presentation exercises. These would be good to have but take a lot of time (also see "Length" below). This is the ideal length for this workshop. I could make it shorter but then I would either have to leave out some content (which is hard) or some of the exercises (which would be a pity; it also wouldn't be much of a workshop any more). I can always make it longer if you want to make more room for exercises. If you give me an extra hour, we can even do some presentation exercises. Since the workshop includes group exercises, we need enough people to at least form 2 groups. On the other end of the range, group dynamics usually break down if you have more than about 30 people in a room. Material: Participants should bring something to write for their notes and for the exercises. Paper notebooks are fine but we also need some loose paper for the exercises. A laptop (or other computing device) is not required! The target audience for this workshop is the typical geek - a software developer of sorts or someone from a related field (e.g. test, or a team lead). Someone who's usually deeply involved in technical topics but now has to give a presentation about what they are doing - something they may not be comfortable with or that they haven't really been told how to do. The end result of this situation is usually a very accurate, very technical, very dry and not very engaging presentation. Which language will the workshop be in? I can give the workshop in English or German. What exactly do you mean by "conference or user group"? I'm thinking of general open source conferences (FOSDEM, FrOSCon, OSCON, or smaller local events), conferences dedicated to specific programming languages (PyCon, JAX) or specific (preferably) open source software (such as PostgreSQL, KDE, etc.). Similar for user groups - if you run the local PHP user group in your town and would be interested in having me give the workshop there, let me know. If you want me to give the workshop at your company: I also offer commercial training courses. Please contact me (see below) and I'd be happy to make you an offer. Can we charge participants for the workshop? If you need to raise money to pay for my expenses, then please fell free to do so. I'd prefer the workshop to be as affordable as possible for the participants, i.e. ideally it should be free. Is the content the same as in the book? There is quite a bit of overlap, yes. The workshop and the book were created more or less in parallel. A workshop requires a different approach, though, so it's not strictly following the book. Also, the workshop itself is an example for the type of presentation it advocates. What are your requirements for the room? I need a projector for my slides. A whiteboard or flipchart would be nice to have but is not a requirement. The room itself can be a meeting room of sorts with movable chairs and tables (preferred) or a more traditional university-style lecture room (less ideal for the group exercises, but doable). 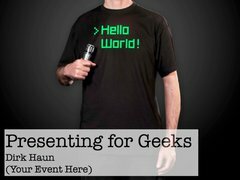 "Taking "Presenting for Geeks" on the Road" by Dirk Haun is licensed under a Creative Commons Attribution-ShareAlike 4.0 International Licence.